Do It Myself Blog – Glenda Watson Hyatt » What is Accessibility? In the Accessibility 100 series, I have been sharing practical tips for increasing accessibility for people with disabilities. But, what is accessibility, really? A – Accepting attitudes: Without acceptance of people with disabilities, accessibility is pointless. C – Creativity: Finding an accessible solution oftentimes requires thinking outside of the box. C – Citizenship: Accessibility enables an individual to be a participating member of a community. E – Encompassing: Accessibility encompasses all facets of life. S – Society’s values:The level of accessibility, in terms of physical access and acceptance, reflects how a society values its citizens with disabilities. S – Success: When I can get where I need to go and do what I need to do, that is definitely a success! I – Increases independence: There is so much I can do myself because of accessibility. B – Belonging: When I can physically get somewhere, I have a sense I belong there. I – Initiative: Accessibility doesn’t merely happen. It takes effort and commitment. It requires initiative. L – Living life: The higher the degree of accessibility, the more able I am to live my life as fully as possible. I – Interaction: Accessible buildings, accessible services and accepting attitudes enable greater interaction among people, all people. T – Teamwork: For a place of business or an organization to be accessible, it requires a commitment from every level. Accessibility entails communication and teamwork. Y – You: Accessibility actually begins with you: you welcoming me, you keeping aisles clear, you installing a grab bar or automatic door opener, you approving the budget, you launching an accessibility improvement project, you holding the door open. You make accessibility possible. Thank you. Equality and respect – most definitely, Karen! Ditto deafmom’s comments! In addition, accessibility to me means going beyond compliance and checklists and being all about the people. Most definitely, Ruth! 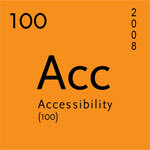 It seems like the reason for accessibility is often overlooked. Glenda, I came over from Liz’s post about you. You rock. Thank you for your blog Glenda and for encouraging me to think about these issues. Accessibility for me means inclusion. I definitely think this could serve as a cornerstone to your presentation/talk. For me-Accessibility is a dignified bridge to full participation in society. It’s as just about elevators and curb cuts as it is the active removal of attitudinal barriers.